Like many people, I've been a Dr. Seuss fan since my childhood. I grew up reading The Cat in the Hat, Green Eggs & Ham, One Fish, Two Fish, Red Fish, Blue Fish & And to Think That I Saw It on Mulberry Street, among others. The Lorax, just in case you didn't know, is a story with an environmental message. I've always intended to add a copy of it to Sprout's growing library. I'm not a huge movie fan, but I did get excited about getting to see a sneak preview of the latest version of a Seuss story on screen. Plus, the screening was at 10:30am on a Sunday--it fit into Sprout's nap schedule perfectly! seats from folding & 'eating' your toddler. Sprout loved taking the Seabus over to the theatre in North Vancouver. When we arrived, we got our Buddy Holly style 3D glasses (including kid-sized ones for Sprout), picked up our free refreshments, grabbed a booster seat & sat near the front of the theatre. After a short spiel by the sponsors, Seventh Generation, the movie began. Predictably, Sprout kept taking his 3D glasses off. I guess the annoyance of having something sitting on his face was too much--he preferred to watch the movie blurry. He did sit through all 95 minutes of the film, half the time on his booster seat, then on my lap. Directors Chris Renaud & Kyle Balda kept The Lorax movie true to the ideas in the book, while wrapping another layer around the original story. Our hero, Ted (voiced by Zac Efron), lives in 'Thneedville', which is run by the evil O'Hare corporation. Ted goes on a quest to find a real, live tree (there are none in his town) for a girl (Audrey, voiced by Taylor Swift) he has a crush on. The story Seuss wrote forms the basis of the tale told to Ted by The Once-ler. The curmudgeonly Lorax is played perfectly by Danny Devito. The movie was fairly fast paced & appropriately Suessically colourful. I noticed a number of little pop culture references for parents to chuckle at, slipped in by writers Ken Daurio or Cinco Paul. I think anyone three or four years old & up would probably like it. Sprout was definitely a little young for a movie, though he seemed to enjoy most of it, except when he got a little upset in one scene as the Lorax flew away. I haven't seen many 3D movies & don't really feel it adds that much to the experience. That said, I think Art Director Eric Guillon managed to use Seuss' characteristic no-straight-lines style as a jumping-off point for The Lorax's digital animation, resulting in a film that's got touches of photorealism in the midst of all the stylized fantasy. I liked the environmental message in the film & how it empowers kids to do something about it. I like how there is an anti-corporate message in there. However I was annoyed to see the usual gender stereotypes trotted out for us again. You know: 'boy meets creative dreamer girl, he falls for her, then goes on a quest to get her the object of her heart's desire'. Aren't we past the whole knight-in-shining-armor story yet? Wouldn't The Lorax have been better if Audrey had just gone off in search of the tree herself? My verdict: If you've got kids or you're a Seuss fan, celebrate what would have been Dr. Seuss' 108th birthday on March 2nd by seeing The Lorax. Then stop by the Sprog Blog here & let me know what you thought in the comments section below! 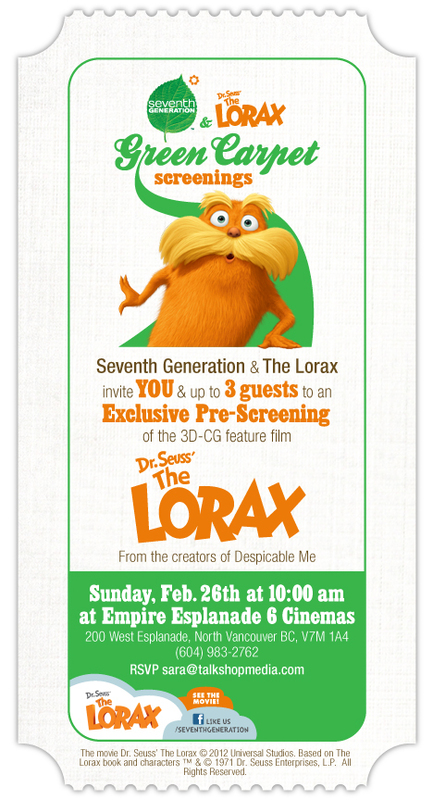 *Talkshop Media gave us free passes to see an advance 'Green Carpet' screening of the Lorax, sponsored by Seventh Generation. We also received free popcorn & drinks, plus detergent, baby wipes, coupons, a Lorax stuffie & three cloth bags from Seventh Generation.